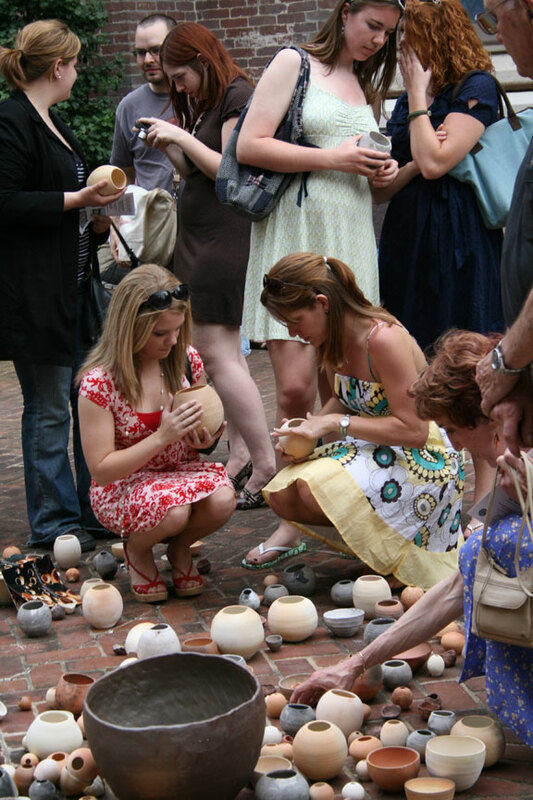 Approximately 1500 wheel-thrown vessels of varying clay bodies & firing methods, 18x18', 2008. Nothing exists for its own sake, but for a harmony greater than itself, which includes it. A work of art, which accepts this condition, and exists upon its terms, honors the Creation, and so becomes a part of it. Wendell Berry, Standing by Words, 1983. A vessel is designed for ongoing acts of emptying and filling, of giving and receiving. The vessels in this installation form a population of individuals connected by similarities in their spherical form, their opened mouths, and the markings of fire on their unglazed surfaces. The sense of community is continued through the grouping process, which is based on natural patterns of clustering, passage, and migration. The vessels may experience a literal migration when viewers choose to carry them away from the public space of the garden, and into their homes or other personal spaces. As the installation is thus enlarged and dispersed, it moves beyond the sole control of the artist, and into the shared stewardship of a greater community of people. Commonage installed at Christ Church Episcopal Cathedral, Lexington, KY, April 2008.